Life's little details...: Art Journaling with Jenn DuBell! 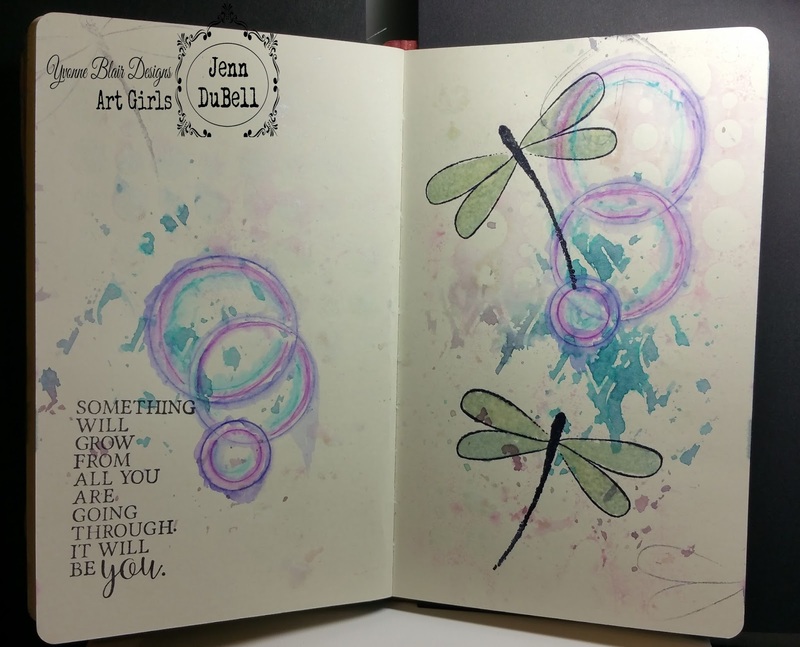 Art Journaling with Jenn DuBell! I love art journaling! It's so fun and unique to each person! There is no right or wrong...just do your thing. Love the fun colors Jenn used on this layout and of course the message! hehehe. Hello everyone, I am so excited to be starting this adventure as a part of Yvonne's Art Girls team! My first share is a spread I did in my art journal. I chose stamps that represented my title "Going Through Hoops". For art journals, my technique is usually done over a period of time. 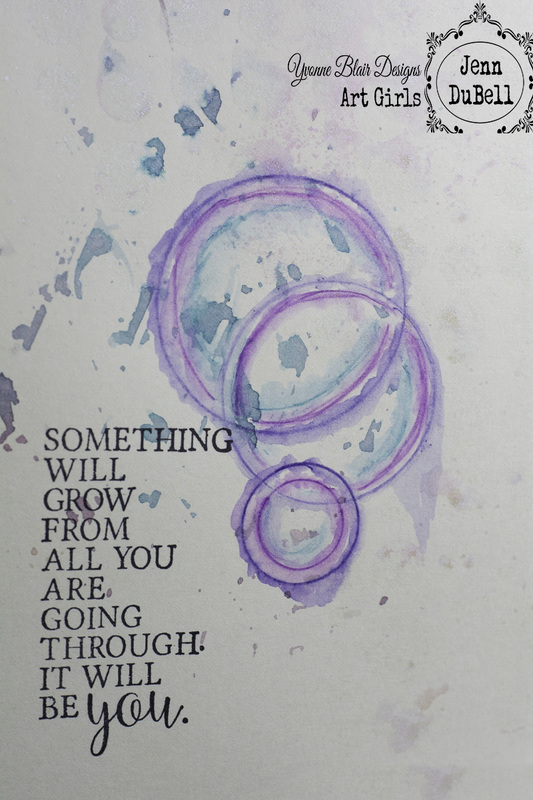 I pick up leftover ink using stencils and water from my craft mat and press onto my pages. 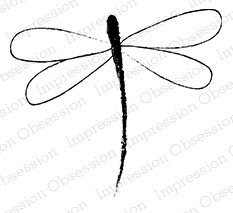 I stamped the dragonflies with black archival ink. The wings were filled in using a Ranger embossing pen and embossed with iridescent powder by Lindy's. For this page, Ink was sprayed onto a craft mat and a combination of two stencils were dipped into it. The stencil was laid in the areas I wanted the pattern and pressed with paper towels. 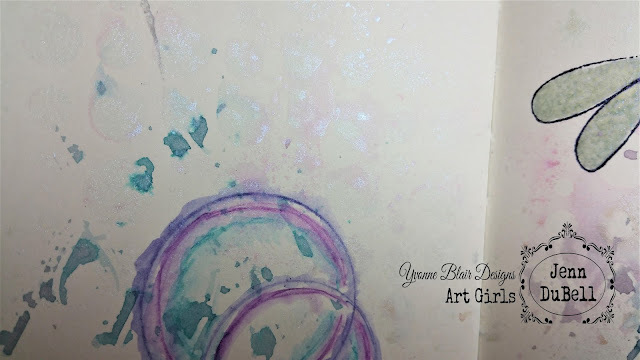 Once that was completely dry, the circles were drawn using watercolor pencils and a water brush. For a final touch of glimmer a light spraying of a glimmer mist. I actually stepped out of my normal style for this because I wanted to try a "less is more" approach. I hope you enjoy! Here are a few closer images to show the glimmer. I used Minx inks by Art Anthology and watercolor pencils by Caran D'Ache. The journal is by Dyan Reaveley Dylusions. Both stencils are from Art Anthology.